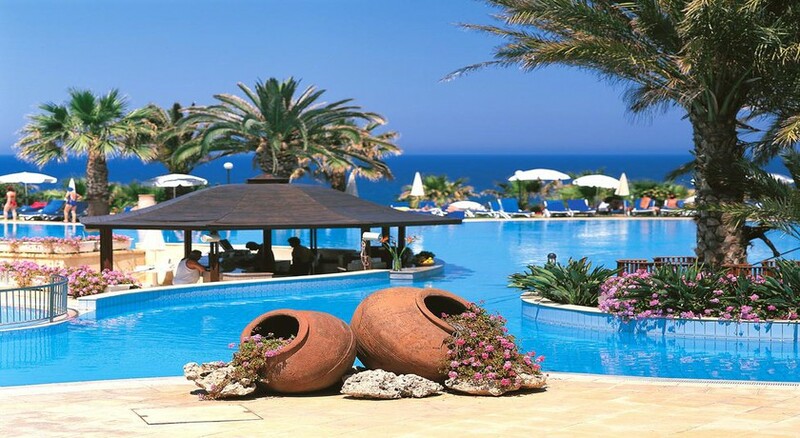 The Azia Resort & Spa couldn’t be any closer to the stunning Mediterranean Sea and the beautiful sandy coast. This 5-star resort and spa offer its guests a luxury stay with exceptional service, and facilities and lies just 23km from Paphos airport. Rooms are spacious, comfortable with large balcony’s that allow guests to make the most of the Cypriot sunshine. They strike a delicate balance between contemporary and down to earth design. Guests have several exceptional restaurants to choose from and Azia Resort & Spa also put on a wide variety of daily entertainment and activities suitable for all ages. Be sure to check out the award-winning spa with plenty of ways to relax, from steam baths to jacuzzi. Azia Resort & Spa combines elegance and luxury with convenience and exceptional service so you can be sure your stay is one to remember. A taxi trip from Paphos International airport can whisk you away to Azia Resort & Spa in 30 minutes as it lies only 23km away. The stunning beach and coastline are only 120 meters away or the equivalent of a relaxed walk. Outside the resort, you’ll find plenty of food and drink options along the main Chlorakas road both restaurants as well as bar and grills and lounges. Historical sites such as the Tombs of the Kings and the Archaeological park are just 2-3 miles away and be easily reached via a quick taxi journey. In Azia Resort & Spa’s own words, ‘luxury comes as standard’. You’ll receive a premium experience in all departments with your room quality being no exception. Every room is uniquely designed with a contemporary aesthetic that carefully incorporates more rustic natural elements of the earth. There are 278 rooms altogether each containing all the essential amenities such as wi-fi, private en-suite bathrooms, T.V., air-conditioning and private balcony or terrace depending on your room. All rooms feature one of several beautiful views, either sea, mountain or garden. With several incredible restaurants on site, you won’t struggle to find great food. All produce is fresh and Azia makes a point of sourcing everything locally, working with local farmers as well as harvesting daily from its own plantation, resulting in the freshest, organic food. Most restaurants serve international cuisine. The amphitheatre offers something a little different by way of alfresco dining by candlelight whilst overlooking the sea, a perfect idea for couples. Cypriot Meze is the place to sample traditional Cypriot dishes whilst there’s also a themed buffet with live cooking at Akamas restaurant. Stay entertained with the comprehensive programme that Azia Resort & Spa put on daily with over 190 day and evening activities on offer throughout the week, ranging from exercise classes, archery, shuffleboard and zorbing. There are dedicated kids and teens clubs, which provide a safe and fun way for them to enjoy their stay as much as the adults. You’ll also be able to see special entertainment shows such as the acrobatic show, Latino Carnival and variety among others, all of which provide great fun for all the family. Cancellations can be made up to 8 days before arrival without charge (must be made in writing). Cancellations made 7 or fewer days prior to arrival will lose their deposit. Heavenly, clean, relaxing, restorative, friendly, above and beyond service. Our first holiday in two years and just the two of us, this place is somewhere we WILL be returning to. Can't say enough thank yous to the entire team!